Falling Markets: A Trick or a Treat? Originating from the “Hallow’s Eve”, this day is celebrated remembering the dear ones who have passed away. While this day has strong Christian origins, it is observed across the world. As people around world get their costumes ready for Halloween on October 31st, it is the right moment to sit back and reflect on the significance of this day. What’s the one thing that comes to your mind when you think of Halloween? Halloween has its recall value from scary things, to pumpkins and sweet treats! Now that the markets are falling, is that a trick or treat for the investors? If you are wondering what the relevance of ‘Trick or Treat’ is to the stock markets, here is how it works. The Nifty has fallen nearly 15% from its peak but it is still not clear whether this is a warning to stay away or an invitation to buy stocks at lower levels. Let us look at some of the numbers. India will be the only economy among the 10 largest economies in the world to grow at 7.5%. In terms of Purchasing Power Parity (PPP), India’s contribution to incremental GDP in 2018-19 will be marginally more than the US and it will be substantially more than the US (by 700bps) by the year 2022-23. Secondly, while the index may have corrected by about 15% since its peak, specific sectors like realty, NBFCs, oil, autos, and metals have corrected anywhere between 30-60%. Obviously, when an economy grows at 7.5% but its stocks correct so sharply, it cannot be a message to avoid the market. In fact, the market is playing a harmlessly wicked ‘trick-or-treat’ game with the investors. How should investors respond to this game? One thing is certain that the market is nowhere close to the despondence of 2000 or the despair of 2008. Those were exceptional circumstances. This is the time to restructure your portfolio. Even if you have chanced your arm with lower quality stocks and got lucky, don’t test your luck much longer. The market is sending a clear message that, in the end, it is quality that will pay. Good old balance sheets cannot be ignored. Stocks like Indiabulls Housing and DHFL got battered in the markets not because of the conspiracy of short sellers but due to the fundamental flaw in their model of funding long-term assets with short-term loans. IL&FS is the best example of this folly. Don’t focus too much on your ability to catch the highs and lows of the market because rarely anyone has succeeded in doing so and it is unlikely that you will either. You should rather focus on a more systematic and phased approach to trading. This will serve you best in volatile markets, and eventually, you will end up with lower acquisition costs. Hope is a good breakfast but a bad supper. If a stock has corrected 60% in the last one month, there is something seriously wrong. Don’t chase such stocks unless you have clarity. If you are stuck at a higher position, just exit the stocks and take a fresh view on the markets. Averaging is bad but averaging and hoping for recovery is worse. Halloween, like Christmas and Valentine’s Day, is more of an international celebration that transcends borders. 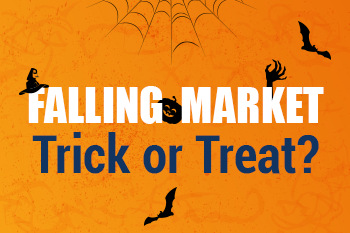 As you prepare for the Halloween festivities, the question is whether the stock markets are tricking or treating you. This would largely depend on whether you manage to interpret the message of the market or try to outsmart it. The choice is entirely yours. Happy Halloween!